Paterson then spent four years happily living and working among the Japanese-with whom she thought she would spend her life. “But when I returned to the States for a year of study in New York,” Paterson reveals, “I met a young Presbyterian pastor who changed the direction of my life once again.” They married and soon Paterson fulfilled her dream of having lots of children. It is then that she eventually began writing. A church friend took her to a creative writing course-and after some time the novel she wrote in that course was published. Paterson’s books have earned her two Newbery medals (Bridge to Terabithia (1978), Jacob Have I Loved (1981)), two National Book awards (The Master Puppeteer (1977), The Great Gilly Hopkins (1979)), a Boston Globe-Horn Book Picture Book Award (The Tale of the Madarin Ducks (1990)), and many other accolades. Her most recent books are Giving Thanks: Poems, Prayers and Praise Songs of Thanksgiving (Chronicle Books) with illustrations by the renowned scherenschnitte artist Pamela Dalton, A Stubborn Sweetness and Other Stories for the Christmas Season (Westminster John Knox Press), and Stories of My Life (Dial Books). She remembers the summer of 1953 as a turning point in the way she viewed the world. Although she had lived in China as a child, it wasn’t until that summer that she became aware of the ways the rest of the world looked at the United States, certainly with gratitude for U.S. help in World War II but also with resentment. Many people in Europe thought that the United States was rich and arrogant. They also had trouble understanding the U.S. paranoia with regard to the Communist countries. The sudden death of a child in Bristol was an ominous foreshadowing for the death of Lisa Hill who, many years later, inspired the writing of Bridge to Terabithia. She is a Vice President of the NCBLA. If you are on Facebook, find Katherine Paterson at Facebook.com/Katherine-Paterson. 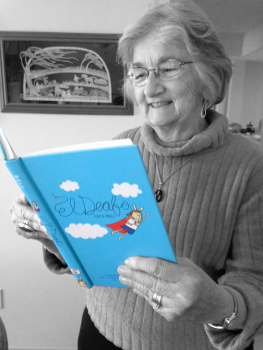 Author Katherine Paterson recommends El Deafo (Amulet Books, 2014), written and illustrated by Cece Bell, as a Great Read for ages 8-12. Check out more Great Reads on thencbla.org.